I dreaded the look of my living room so I am in a quest to make it really nice this time. It’s so packed with toys, books and little knick-knacks that it is no longer warm and cozy. I have the same wall art since 2005 so I am looking for a replacement. The simplest thing is just what we need to spice up a space. 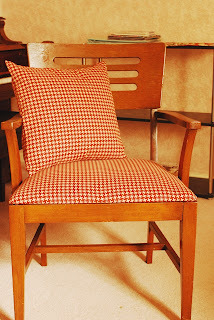 During the week, I made simple pillowcases and change the fabric of an old chair I purchased in a thrift shop to unify the color in the room. If you can cut squares and rectangles, you can make this easily in less than 2 hours. I used 18” (45.72cm) square pillow form but any size can be sewn in the same manner. You just need to adjust the sizes of the fabric to cut. I sew this using a ½-inch seam allowance (otherwise indicated) which is already included in the cut fabrics. 2. On one side of Fabric B, fold ¼ inch in the outer edge of 18”-side twice then sew to secure a clean edge. 3. Do step 2 for Fabric C, also in the 18”-side. Lay Fabric A flat in a sturdy surface with right side of fabric facing up. Pin Fabric B on top of Fabric A’s upper side edge with right side of fabric facing each other. Next, pin Fabric C in the lower side of Fabric A with right side facing each other. 5. Sew the four sides to finish the pillowcase.